Events of these last few months continue to be a persistent reflection of everything that is wrong with humanity today. North Korea seems to be on everyone’s lips these days, and every other problem facing our planet is almost becoming a footnote as the world gets embroiled in the potentially impending threat of war. You cannot help but sit and think about the whole grand scheme of things, so allow me to throw my two cents into the issue on the situation in the Korean peninsula and how it relates to the rest of the problems facing humanity. Truth be told, millions the world over are fearing the outbreak of a full scale war stoked by the goings-on in North Korea. It is a problem that has been bubbling underneath for several decades now. But we seem to have reached a tipping point where the prospect of a third world war is not such a far fetched idea after all. As we speak, hundreds of weapons are locked in on Seoul, a city of 10 million residents, with the greater metropolitan boasting a population of 25 million. Hundreds of thousands of rockets remain within the range of South Korea’s capital, and it’s not like other close neighbours remain safe either. Iran is putting out threats too. A recent missile was fired towards Northern Japan, with residents taking immediate shelter underground. The U.S. president has warned that North Korea risks ‘total annihilation’ if it threatens America or its close allies, Japan and South Korea. All these countries have been involved in war rhetoric the better part of this year, and there seems to be no end in sight. The North Korean regime is threatening even more missile tests and tells America a military invasion of the secretive state will result in ‘the greatest pain and suffering’ in America’s entire history, and that the U.S. will be turned into ‘ashes and darkness’. President Trump, on his part, warns the dictatorial regime that it risks ‘fire and fury like this world has never seen’. South Korea has been keen on a peaceful resolution of the conflict, as it has for the most part, but warns its northern counterpart that if it keeps up its threats to invade the South, the North will be ‘destroyed beyond recovery’. 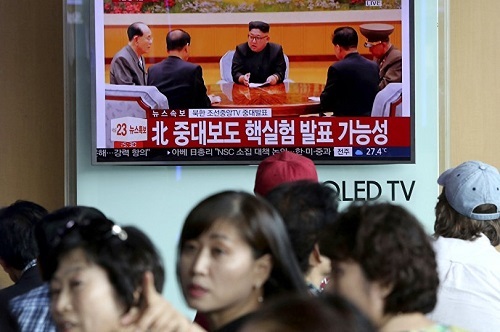 Japan, a country that will probably never fully recover from the atomic bombings of its two cities during WWII, was recently told by North Korea it would be ‘sank with a nuclear bomb’, and that it ‘no longer needed to exist’ near North Korea. North Korea’s nuclear program has been in the works for decades now. It has always been used as a bargaining chip by the regime against the West. Lately, it has grown into such a key component of their national security that North Korea is not ready to trade it anymore in exchange for the lifting of sanctions against it – never mind gaining acceptance and recognition from the international community, something they so desperately crave. North Korea is at a vantage point considering its neighbours stand to lose the most should it come down to war. And this is why they continue to show arrogance and disregard for millions of people’s lives. Amidst all the pompous talk and displays of military might, you cannot help but wonder about the situation of the people of North Korea. They continue to suffer under the dictatorship as the leader channels the little resources available into the military. His overall ambition is not so much to protect the people of North Korea. Rather, it is for the Kim dynasty to cling on to power for as long as the current leader breathes – and his son after him – and avert any ideas of a regime change from the West. In short, he wants to retain the status quo where the people do not vote-in their leaders through elections, but instead, have the leaders imposed upon them. To continue the stranglehold of power by one family, with the citizens playing oppressed subjects with little say over anything – not even their existence. But it’s not like the regime, since the days of Kim Jong-un’s grandfather, has always put a lot of stock in the welfare of the people anyway. The truth is that their leader is a brutal dictator who really doesn’t care about his people’s health, education and general wellbeing, let alone safety. This is why he continues pouring resources into all the wrong areas – from nuclear weapons which, hopefully, will never be used, to lavish banquets for him and his cronies, all the while as his people continue to starve and wallow in poverty. While there are a few people who lead decent lives in the country, life is more of a daily struggle for the majority whose entire lives are more focused on eking out a living. Thinking about it, it is saddening really. The leader continues to pour more and more resources into the military, while his people continue to starve, as they are fed with empty rhetoric about the god-like powers of their leader. When he took over power from his father in 2011, the world waited in baited breath to see if Kim Jong-un would offer North Korea the fresh start it badly cried out for. Sadly, it wasn’t to be, and if anything, things have only exacerbated. But the problems plaguing North Korea are not unique to the repressive authoritarian state. Not the oppression and brainwashing part, but the tendency by world leaders to lend more credence to matters such as war, while more pressing problems continue to plague their respective nations. Of course, it would be naïve of me to think the world can turn into nirvana where all the problems and hate are washed away; in their place, a state of perfect bliss. It doesn’t work like that, and evil will always rear its ugly head every now and then. My point is, if we could dedicate as much interest and energy into addressing issues such as poverty, and plough such massive resources as goes into the military towards these projects, humanity would without a doubt be in a better place. This world has many problems to contend with other than disarming North Korea – although the other side of the coin is that this could finally liberate its people from the overbearing shackles of the selfish dictatorial rule. There still remains massive social, economic and environmental problems. Food insecurity. Poverty. Disease. Forced labour. Human trafficking. Refugee crises. Drought. Irregular weather patterns. Pollution. Depletion of energy resources, and many more. No one is saying the issue of North Korea is not important. It is – millions of lives are at stake, never mind the ripple effect that would stem from such a calamitous outcome. However, let’s not lose ourselves in the war. There are plenty of problems that remain unresolved. They have been for decades, and so many lives have been lost along the way than any war could ever claim. Wouldn’t it be progress if we bid adieu to issues such as malnutrition and death from starvation once and for all? With all due respect, the title of this article doesn't match with its nostalgic contents, and vis a vis It's more moralistic than being an analytic approach of the issue.